I'm lucky enough to live down the street from my film developer, Austin Camera. While that is great for me now, I've also lived in a smaller city and had to take my film to a store that shipped out for development. To help everyone out I'll send some rolls out to popular online mail order developers and let you know what I think about their services. Starting off is Old School Photo Lab which is based out of New Hampshire. They have been active in the film photography community on social media and seem like genuinely nice people. The twitter community swears by them and they were easily the first service I wanted to test. Old School Photo Lab (OSPL) has a very straightforward process. You first decide what you want in terms of development: film format, film type, prints, scans and extras like push processing and cross processing. After that you add the items to your cart. If you are have multiple rolls with the same needs you can just increase the number for those settings. You then print out a mailing label and a receipt and send it off. Postage is included in the price so no need to go to the post office. I found only one issue with the service. While I was using the mobile system I could not figure out how to delete a messed up item. I had to go to my laptop and redo my order, this isn’t a huge deal but with mobile being so prevalent it’s something that should be fixed or made simpler. If I’m missing something really blatant about this let me know. I sent out my film on October 24th and received my scans on October 31st and the negatives came on November 3rd. That’s one week for scans and 10 days for negatives to get back to you. That’s pretty darn fast, I bet the biggest driver of time is how long it takes the film to ship to them in NH. Scan quality was great. I had sent 120 film and went with regular scan quality. They were sized at 2416x2380 and I really liked how the they handled my scans. The images were scanned to allow the customer to choose the final look of the image and OSPL were restrained when it came to contrast adjustment and saturation. This approach is really what I’m looking for in a scanning service that are not super familiar with what I like to do with my images. To get your scans back you are emailed a link to their website with a password. I’m used to having a dropbox link emailed to me and adding the folder to my account but I’ve filled up my dropbox doing this pretty quickly. Using the secondary website was easy but I didn’t like that in order to download the images on the website required a zip file to be sent to you. I’m not opening that at work. To get around this they offer an app in which you can download the images directly which really is the best of both worlds. I’m not a huge fan of downloading another app but if you use OSPL a lot it is a lifesaver and very smart move on their part. I didn’t have any issues with my order so I didn’t need to call them, which in reality can be the best customer service. When I got my negatives back in the mail they included a hand written thank you card and some complimentary prints. While these things don’t cost a lot they didn’t need to either. I’ve heard other people getting candy back with their negatives and weird requests for the film canisters as well. Another part of customer service is servicing the community that supports you. Check out this exchange with Jon. OSPL knows their position in the community and that they can really help people out when they have problems. It doesn’t take a lot of time or money but this type of care really shows. 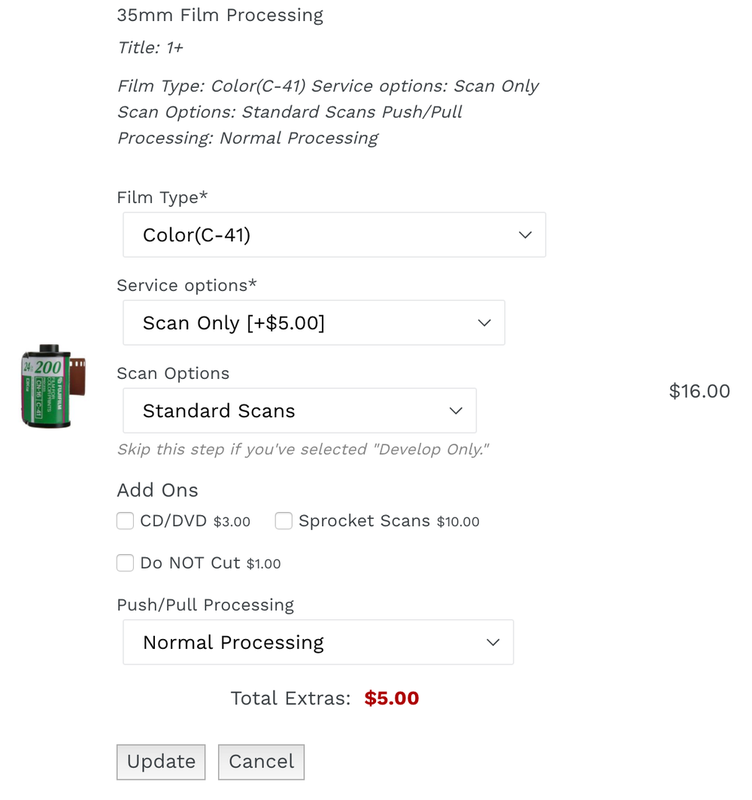 One roll of 120 film cost me $16.00 and was shipped free both ways. If I was to ship it on my own it would cost about $6, I’m pretty sure OSPL get’s some type of break but that’s about $10 for development and a total steal. I couldn’t be more happy with the service and only really had some minor issues with the ordering process which I think could be easily fixed. I probably should keep this review just to the service they provided me but their impact on the community shouldn’t be under emphasized. They care about the community that they serve and when do that you help people who may never spend a dollar with you. That’s paying it forward.